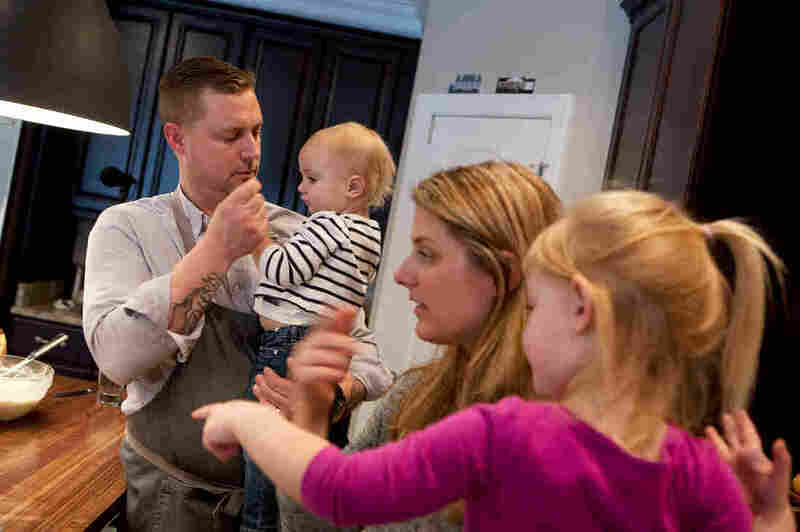 Busy Chef Strives For Balanced Mix Of Home Life, Culinary Ambitions Restaurant owner and Top Chef finalist Bryan Voltaggio tries to find the right recipe for blending work, family duties and the pressures of being on the road. 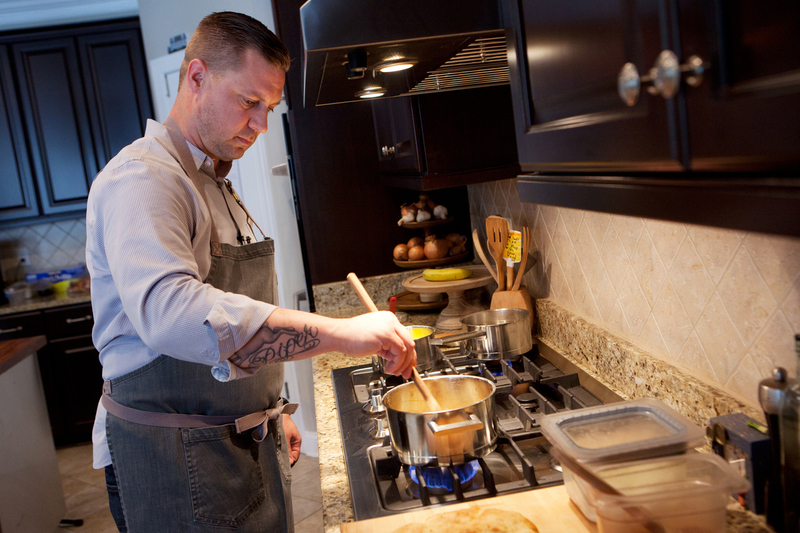 Chef Bryan Voltaggio cooks at his home in Frederick, Md. He has restaurants in and around Maryland and Washington, D.C.
Home for Voltaggio is Frederick, Md., a small city with a charming downtown about an hour west of Baltimore. 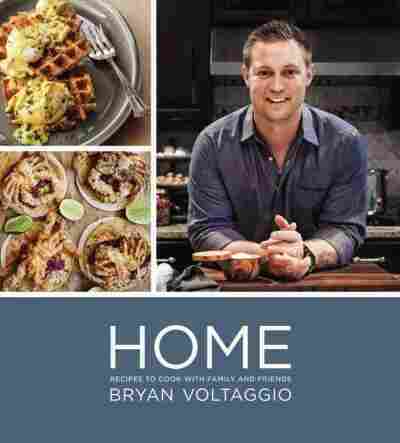 His cookbook is full of recipes from the Mid-Atlantic region, including Chesapeake crab waffles and bacon biscuits. His wife, Jennifer, says the cookbook's name is a bit of a misnomer. "We were going to call it 'Occasionally Home,' " she says. His editor didn't approve. Jennifer was his high school sweetheart, and at the beginning of their relationship, she was the one cooking for him. At the time, Bryan lived with his father and worked 40 hours a week at a Holiday Inn. He would often come to school without food. "I couldn't sit there and watch him not eat anything," Jennifer says. So she started packing him a lunch every day. Now he loves to cook for her, and for the crowds that pack his five restaurants in Maryland and Washington, D.C. One reason he kept his restaurants local was to make it easier for the family. Still, he worries about the time he spends away from Jennifer and their three children. "There's a lot of time I wasn't home being supportive of us as a family and being there to help change the diapers, you know what I mean? To do the things that we need to do to raise kids," Voltaggio says. 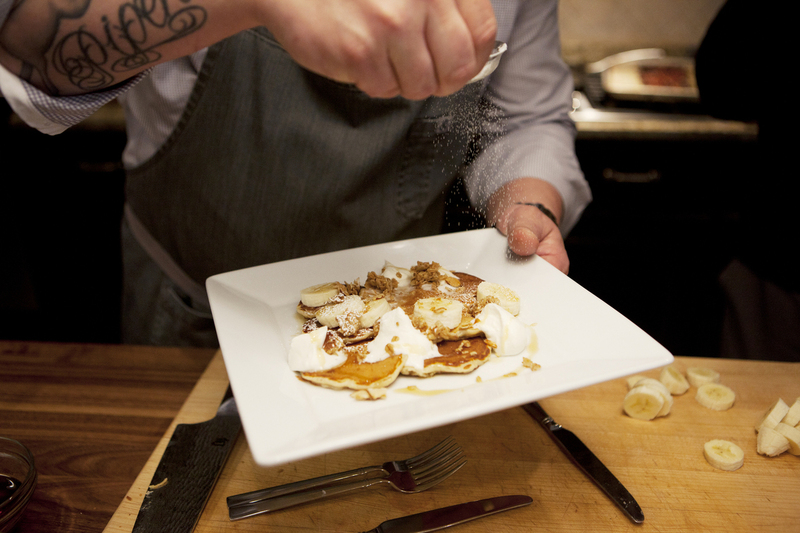 Voltaggio sprinkles sugar on granola pancakes, a dish from his new cookbook, Home. But there are a lot of perks that come with a life like Bryan's, says Jennifer. He's on the road a lot, but there are plenty of opportunities for vacationing together in popular spots like Disneyland. "Food is powerful," Voltaggio says. "It gets us places." Still, the need to balance work and family came into stark focus when his third child was born. Nearly two years ago, his daughter Ever was born prematurely. She had severe respiratory problems and spent the first weeks of her life in the hospital. "It was the most difficult time of our life. I'm a chef. You're a control freak if you're a chef. I couldn't fix my daughter," says Voltaggio. "I want to be there for my family, I want to do more, so I'm starting to find that I'm fighting for the time." Voltaggio with his wife, Jennifer, and two of his three children, daughters Ever and Piper. The chef is focused on finding a good recipe for work-life balance. Now, he's focusing on expanding his restaurants regionally so he can stay close to home. "Bryan's drive and love of what he's doing makes it hard for me to say, 'Oh, you can't open this, or you can't do this, like it's too much for our family,' " says Jennifer. "Every time he comes to me and says 'I'm going to open this new restaurant,' I'm like 'Uh, not again.' But it always seems to work out."